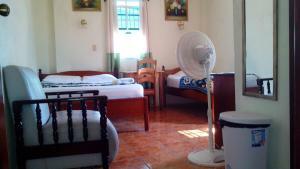 ﻿ Best Price on Mystic River Resort in San Ignacio + Reviews! Mystic River Resort offers beautiful riverside cabins surrounded by rainforest, just 6.2 mi from San Ignacio. This luxury resort features a private river beach, a spa, organic gardens and an open-air restaurant. Each stylish fully equipped suite is set in an independent cabin with wonderful river views. All suites have a sofa, a safe, and a private bathroom with bathrobes. Mystic River Resort’s tour desk can arrange many activities and excursions. These include horse riding, canoeing and river tubing, as well as visits to Mayan ruins and guided treks through caves and waterfalls. Free parking is available at the Mystic River Resort. The border with Guatemala is only 16 mi away, while Belmopan is 28 mi away. This resort is not cheap and is off the beaten track a little but it makes up for that in great hospitality and fantastic rooms. With tea or coffee delivered to your room in a flask in the morning to the free tea and coffee while they do bird feeding with incredible small toucans, it’s fantastic. Great trails that give amazing views over the area and central enough to easily drive to Tikal, xunyantich and the national park - it’s great. The rooms are beautiful - large, extremely tasteful and with a verything you need. With wine tasting, great food & such a beautiful place we would go back.